1) The award of the 2015 CIDETEC prize for the modality of "Scientific Research", worth 4000 euros, to the Electrochemistry Research developed over the last 4 years by the research team represented by Professor INMACULADA ORTIZ URIBE, from the University of Cantabria. 2) The award of the 2015 CIDETEC prize for the modality of "Young Researchers", worth 2000 euros, to the candidate Mr. EDUARDO LABORDA OCHANDO from the University of Murcia. 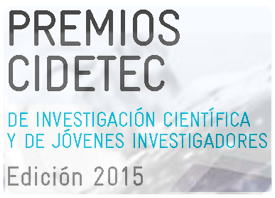 The awards ceremony will take place next July at our annual meeting that will be held in Alicante.